Uwharrie is one of the few remaining public trail systems in the eastern US. Hi Everyone – I wanted to send out the message about the January 28th Work Day. We’ll meet at 9 am at the Uwharrie Hunt Camp. We’ll work on armoring several wet areas on the trails with rock from Cotton Place TH, Dutch John TH and from sources on the trail. We’ll also put up some short sections of guardrail or the old log barricades up. If you have a trail trailer, pickup truck or other vehicle that can be used to haul rip-rap, large gravel, posts and guardrail please bring it that weekend. Also, if you’re chainsaw certified please bring your PPE and saw, etc. because we might not get out to the trails before then and with the storm this weekend we might have some trees come down on the trails. Some photos taken from a recent work day cleanup in 2016. 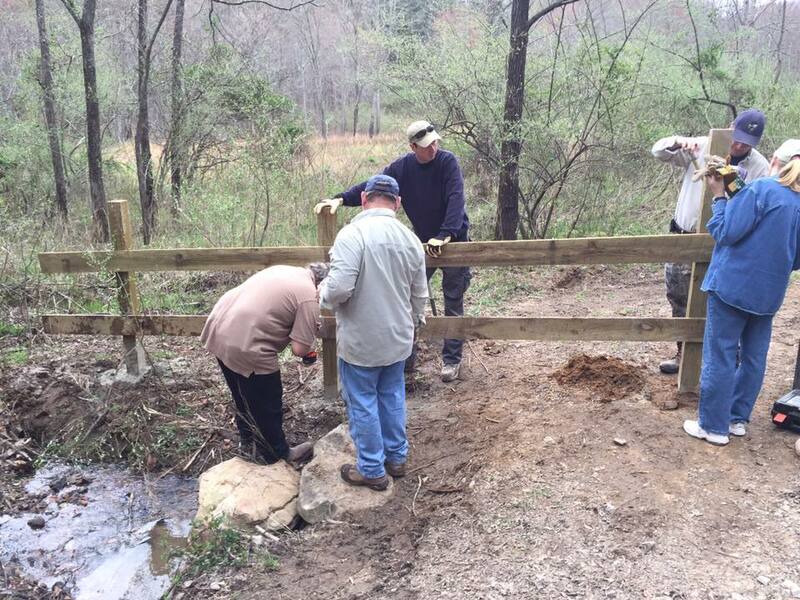 These events are all about volunteers working to ensure our trail access is preserved. being proactive and preventative. Working cooperatively as enthusiasts with the USFS. From an email blast communicated by our friends at the USFS. This is an open invite for anyone looking to get more involved. Join SFWDA and the USFS for the first of four collaboration workshops focused on developing a plan that will be used to create a proposed action for the Foothills Landscape. This is a great opportunity to share your views, discuss ideas, and interact with other members of the collaboration community and Forest Service employees -- a time to roll up our sleeves and really get down to work. We have had quite a jam-packed fall on the Chattahoochee-Oconee National Forests. The unseasonably dry weather has kept us busy fighting wildfires up north and attending to insect outbreaks down south. These pressing demands demonstrate even more that the need has never been greater for strategic, holistic, large-scale and long-range planning for a healthy, resilient forest. And we can't do it alone. The Community Conversations this past fall gave us an overview of the attitudes, values and beliefs of community members. Now, looking forward, we need to begin to design on-the-ground actions that address the widespread resource challenges in an integrated way and on a scale that results in enduring impacts. We are planning four workshops before the end of August. These workshops will be focused on developing a plan that will be used to create a proposed action for the Foothills Landscape. This is a great opportunity to share your views, discuss ideas, and interact with other members of the collaboration community and Forest Service employees -- a time to roll up your sleeves and really get to work! Please take a moment to check out the thoughtful comments and robust discussions shared during the recent Community Conversations at www.tinyurl.com/FoothillsLandscape. The online forum for comments, discussions and sharing pictures worked so well during the Community Conversations we are going to use it again. In between the workshops you will be able to start discussions, post ideas and add comments on the restoration goals, treatment locations, and methods of treatment. Also, share this update with others and encourage them to sign up to receive emails on the collaborative effort. Thank you for helping make sure we are working together to do the right work in the right places for the right reasons. The Chattahoochee-Oconee National Forests provide the finest outdoor recreation opportunities and natural resources in Georgia. Featuring nearly 867,000 acres across 26 counties, thousands of miles of clear-running streams and rivers, approximately 850 miles of recreation trails, and dozens of campgrounds, picnic areas, and other recreation activity opportunities, these lands are rich in natural scenery, history and culture. The mission of the USDA Forest Service is to sustain the health, diversity, and productivity of the nation's forests and grasslands to meet the needs of present and future generations. We thought a few of you may like to know that the Forest Service published a Federal Register Notice today (Oct. 12), requesting public comment on a minor but important proposed amendment to the 2012 Planning Rule. While the 2012 Planning Rule includes direction specific to national forest plan amendments, the 2012 Planning Rule did not explicitly direct how to apply substantive requirements set forth in the 2012 Planning Rule (requirements for sustainability, diversity, multiple use and timber) to those plans developed under the 1982 Planning Rule. This proposed amendment to the 2012 Planning Rule would clarify the Department’s and Agency’s expectations for plan amendments, including expectations for amending 1982 Rule plans. The proposed amendment is recommended and supported by the National Advisory Committee for Implementation of the National Forest System Land Management Planning Rule (http://www.fs.usda.gov/main/planningrule/committee) and is based on experience gained by early adopter forests, public input garnered through plan amendment processes, and extensive dialogue with the National Advisory Committee. The 30 day public comment period begins on Oct. 12 and ends on Nov. 14 2016. Attached are some Frequently Asked Questions about the amendment. Additional information will be posted at: http://www.fs.usda.gov/main/planningrule/home . We appreciate your on-going interest in the Forest Service and its 2012 Planning Rule. 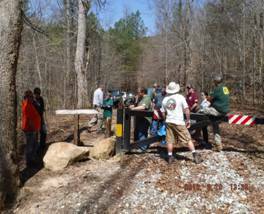 The Georgia Bounty Runners recently held a “Fun Run” a/k/a work weekend at the Beasley Knob OHV Trail System in Blairsville, Georgia March 18th through March 20th, 2016. The GBR really stepped up for a very aggressive funds-match request that the USFS needed for this weekend. The USFS normally gets around $4,000 in matching funds with each of our regular work weekends. Due to the addition of brand new trails and work still needed, they had the lofty goal of $7,500 matching funds for this weekend alone. The call went out and we raised over $10,000 in matching funds with the help of SIXTY-FIVE GBR attendees! This is one of the highest turn-outs we’ve ever had doing the work at Beasley Knob. 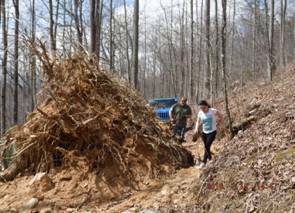 We started with a meeting with Teressa Brown, Forestry Technician with the Forest Service, at 1:00 PM at her office in Blairsville on Friday for pre-planning. We discussed how the OHV area weathered the wet winter closure. She indicated they had not been able to get out much over the trails because all of the rain so conditions were unknown. She did say some of the other areas had many downed trees and for us to “bring out the certified sawyers”. We discussed that three new gates had been installed and people have been making there way around the gates, so one of our big tasks would be to block these illegal by-passes at the new gates. She said she would have a few tools (one post-hole digger, shovel and a rock bar) and supplies (bags of sackret, posts, boards, screws to fasten the boards, etc.) at strategic locations for the work. Unfortunately both of the Forest Service’s gas powered augers were out of commission! Oh no! After the meeting we headed over to the campsite. Since the area was still locked from the winter closure we had to install a specially coded combination lock at the gate so everyone could get in/out without much problem. Next, Rita and I set-up camp at the Satterfield Pay Station off Windy Hill Rd., as others arrived, we set-up plans for work parties to start evaluating the trails and start clearing back the brush. One crew led by Greg Uphole headed out 93C cutting back the brush off the trails and cleaning out water bars. 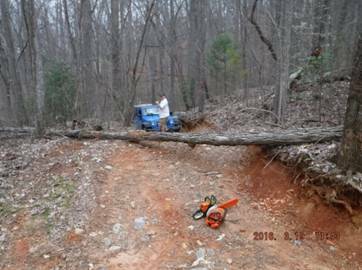 Another crew, led by Kerry Vanderpool worked Trail 93 where they had to cut two trees off the trail. On Saturday morning, we had a parking area full of vehicles! We had a driver’s meeting and went over the game plan. I also gave a short safety briefing giving instruction on proper wear of safety equipment, care for distances around the sawyers and hospital location / reporting in case of an emergency. Then we split out in to five groups. My group started at the Satterfield pay station going back towards Windy Hill Rd. We cut the grass, cut back the brush and picked up the trash as we walked. 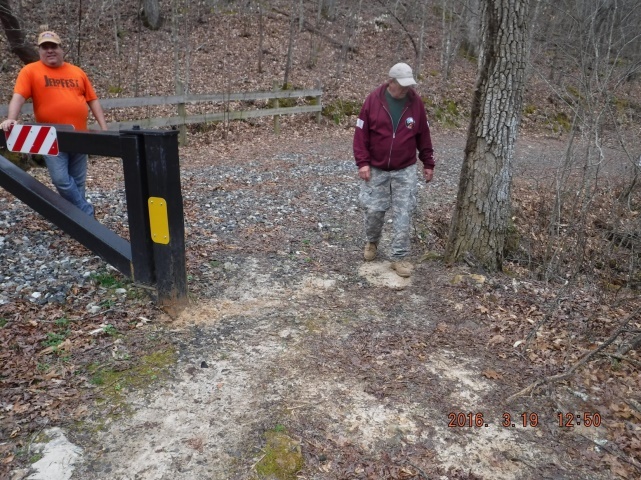 A group of us went to the new gate and installed short fences on both sides of the new gate blocking ghost trails going around gate. We then went to the Blue Rock pay station cutting brush off the road. We then cleared brush off the pay station area and off trail 93. A second group, led by Kevin Sutz, started at the parking lot of 93D and went up Nicholson Gap down to F.S. road 117. They covered the complete trail 93G, Beasley Knob Mountain trail, down to F.S. road 117. They had to chainsaw three trees off the trail and move a small one out of the way. They went to the new gate to stop the illegal bypass around the gate. At the new gate they used a vehicle winch to pull some big rocks into the ghost trail opening. After that they found some posts and installed them behind the rocks they added a cross bar to keep ATVs or other vehicles from trying to drive over the rocks. 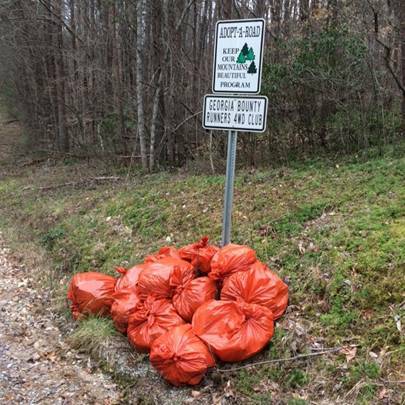 They collected trash, cleaned water bars and cut back branches and tree limbs that were growing over trails . Another group led by Ralph Payne rode 93B cutting back brush and clearing water bars. Our forth group led by Dave Logan rode trail 93D. They cut back brush and cleaned out water bars. They ran into a huge tree blocking 93D. The tree’s root ball pulled up and over blocking the trail. The root ball was over 6 feet tall and the tree at its base was over 4 feet in diameter, impossible for them to move. They changed their route going on another trail and back tracked to the other side of this tree. The fifth group led by Paul Fon traveled trail 93C cutting back brush and cleaning out water bars. His group also had to cut two trees off 93C, one tree at two different locations. Since we could not finish all work on Saturday a group of us stayed overnight and finished the needed work on Sunday. This group repaired part of the fence behind the sign at the Satterfield pay station. We also cut the grass and cut brush, back clearing the camp and parking areas. In a joint effort to provide access to our Federal Public lands at no charge. 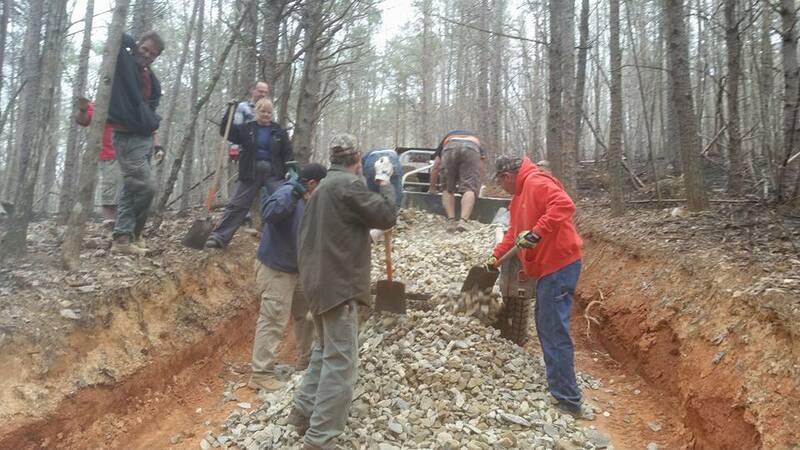 As many of you already know, the Uwharrie OHV trail system is in danger of extinction if not drastic reworking! ALL of our local Clubs and Group Supporters, please note this NFS Trails 101 opportunity on January 24 and 31. UFWDA recognize dedication to managing our environment. United Four Wheel Drive Associations Inc. (UFWDA) were delighted to award their 2014 Environmental Affairs Four Wheeler of the Year Award to Chris Brower of the Carolina Trail Blazers Club (a Southern Four Wheel Drive Association and UFWDA member club) to recognize on an international level, the significant achievements of individuals to recreational four wheeling. This FREE app includes 48 recreation sites and provides information about their facilities and opportunities for hiking, camping, picnicking, fishing, swimming, boating, off-roading, horseback riding, mountain biking, and sightseeing. The app is free and is available for Apple and Android smartphones and tablets.